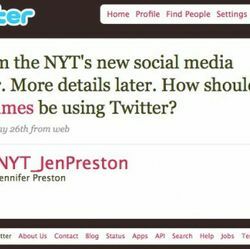 In this episode, Jennifer Preston, Social Media Editor at The New York Times gives the afternoon keynote at The Digital Impact 2010, a conference run by PRSA that I’ve been co-chairing with Elizabeth Albrycht for the last several years. Technical Note: The fidelity of the audio has been compressed to minimize a low-end buzz which was present during the recording. @EricSchwartzman provides online communication training, strategy and social media governance to public relations, public affairs, corporate communications and marketing specialists. He has extensive experience integrating emerging information technologies into organizational communications programs through public speaking, hands-on training seminars, consulting and the development of corporate policies on social media usage. His clients have included Boeing, BYU, City National Bank, Environmental Defense Fund, Government of Singapore, Johnson & Johnson, NORAD Northcomm, Southern California Edison, UCLA, US Dept. of State, United States Army, US Embassy of Athens, the United States Marine Corps and many small to medium-sized companies and agencies. Eric is the instructor behind PRSA’s top-rated social media and emerging treads training seminars, the Social Media Boot Camp and the Social Media Master Class, which are offered monthly in the US.